The best kindergarten activities we've done involve paper crafts for kids. One of the most exciting things my children William and Catherine enjoyed was making something which actually moved! Once you added a homeschool dinosaur into the equation things got really thrilling! Paper crafts for kids are easy and you can adapt them to the age of your kids. Obviously, the younger they are they'll need more help from you, but there are so many ways to make homeschooling paper crafts fun. You'll end up with something which takes pictures into another dimension! 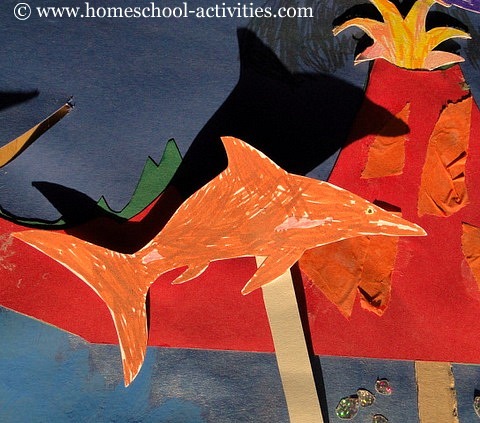 I'll start by showing you how we used easy kids crafts to make this homeschool kindergarten dinosaur scene. The easy paper craft techniques you'll use could be adapted for lots of kindergarten activities. If you want some inspiration for the sorts of dinosaurs you could use, have a look at our homeschooling science dinosaur activities. 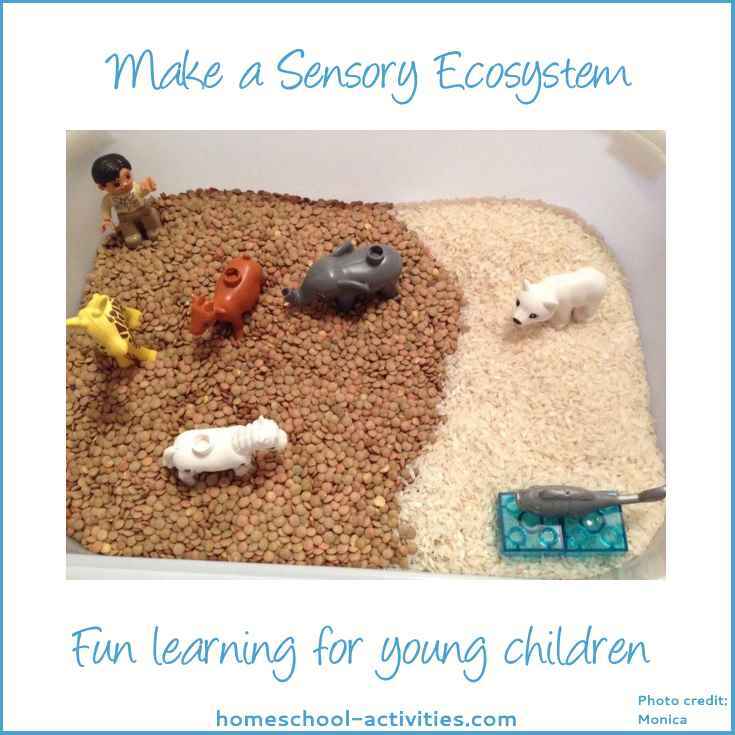 You can also add in other easy kindergarten activities with dinosaurs, like marbling a homeschool dinosaur egg or keeping a real pet Triops, which once lived in the age of the dinosaurs. 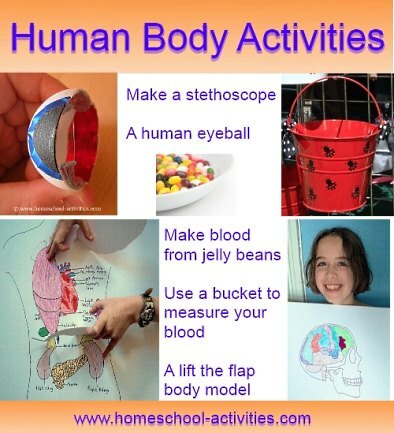 The great thing about these easy homeschooling kindergarten activities is that your kids don't have to be great artists - whatever they produce they'll still enjoy making their creations move and pop-up. Easy kids crafts are just that - easy! But I must say I hadn't realised just how effective it would be adding a few slots and paper fasteners to William and Catherine's homeschool pictures. The excitement of actually watching your paper flames erupt out of the top of a homeschool volcano has to be seen to be believed. 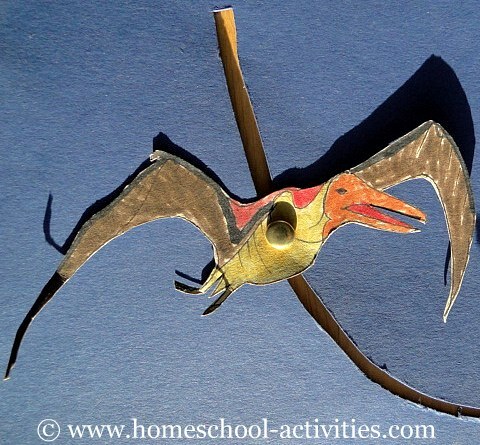 Watching this homeschool pterosaur swoop is great fun for easy kindergarten activities using paper crafts. Get your kids to draw a flying pterosaur on card and cut him out. Cut a long narrow strip of quite thick unbendy cardboard. This will be the handle which your kids will move to make your homeschool pterosaur fly. Attach your pterosaur to the cardboard handle using a paper fastener. 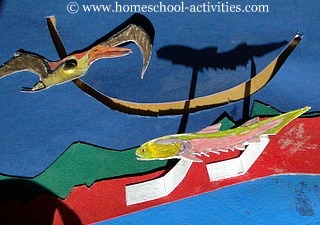 Cut a slot using another piece of card for your homeschooling pterosaur to swoop along. You can make him fly straight or, as we have done, make him do a loop by cutting a semi-circular slot. 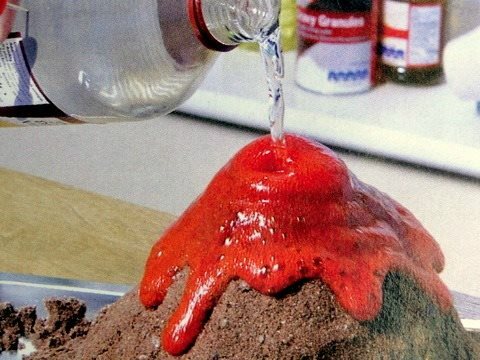 This homeschooling volcano is easy and fun for kindergarten activities. Ask your kids to paint some vibrant flames on a piece of paper card and cut it out with a long tab at the bottom of the flames. Stick the tab on a long narrow piece of cardboard which you're going to use to push up inside the volcano to make your homeschool flames erupt. 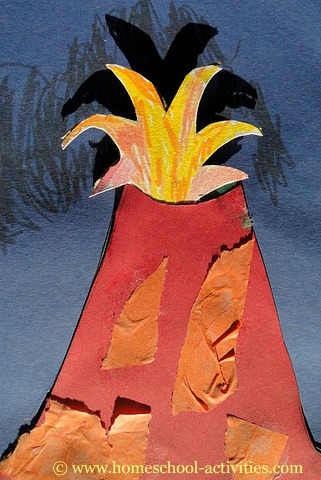 Draw a homeschool volcano shape on a piece of red card with a great towering cone for the flames to come out of. Stick the sides of your red volcano down on a piece of homeschooling card, leaving the towering cone unstuck. Feed the cardboard stick with the flames on top inside your homeschooling volcano cone. When your kids push the cardboard stick up and down the flames burst forth. The nice thing about homeschooling paper crafts for kids is to try out different materials. We used homeschool orange tissue paper on the sides of the cone to make easy lava flows. Cotton wool makes nice homeschool smoke for kindergarten crafts. 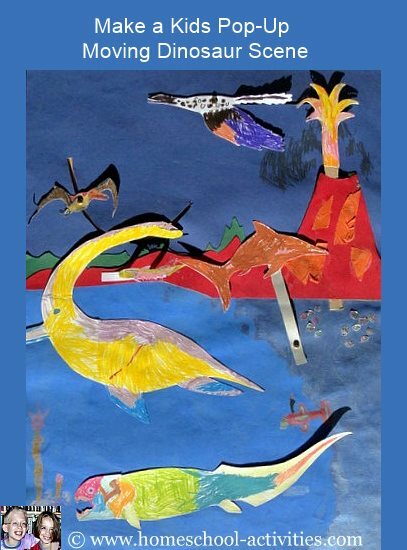 Get your kids to draw a homeschool ichthyosaur or any other dinosaur they fancy which would enjoy leaping. You've got lots of choice! Watch dinosaurs brought to life with videos and kids games here at the BBC and you'll see plenty of candidates. Draw or paint your leaping dinosaur and cut him out. Stick him onto a strip of homeschooling cardstock. 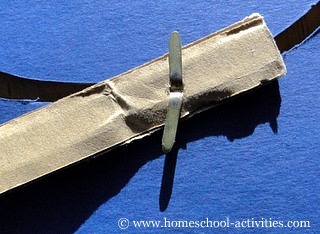 Push a paper fastener through the bottom of the strip and attach it to a piece of cardstock. We added more homeschooling paper crafts for kids by using glittery sequins to make sparkles in the sea as the ichthyosaur dived. Fingerprints make easy homeschooling wave crests. 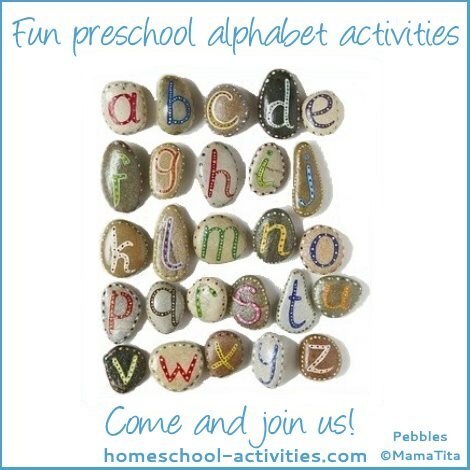 I've used tabs a lot for homeschooling kindergarten activities using paper crafts. They are so easy to attach to any kindergarten drawing. Cut a narrow tab of card and bend it into 3 separate segments. Glue the top segment to your drawing and the bottom segment to your card. Push down and your drawing lies flat, push up and... Bingo! Your fish pops out. You can simply add a tab to your drawing which you can pull on. Catherine has done this very effectively to get her prehistoric fish to escape from the jaws of a Dunkleosteus in our page on Dinosaurs. 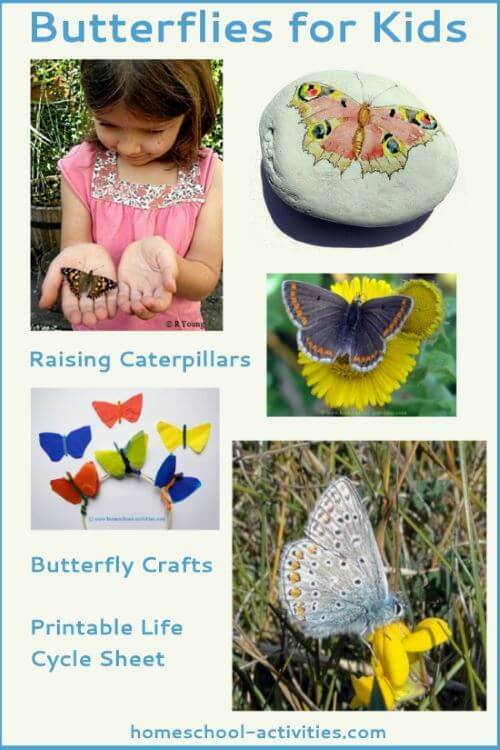 Kindergarten activities are a great time to experiment and try all sorts of easy ﻿homeschool activities.